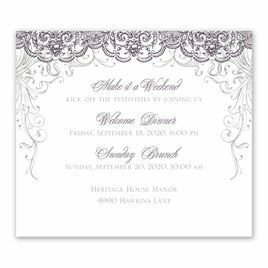 Please Note: Due to the unique printing process required to offer you this invitation and its coordinating pieces at a lower cost, you will personalize the invitation and response card together; however, you will receive the pieces separately. Came out amazing! We got them super fast! I ordered these invitations for my 2018 wedding on Monday night at 10pm. I received an email confirmation saying they were shipped on Wednesday, then they were on my door at 5:45pm Thursday! I could not believe how simple the process was to change the wording, font, and template colors so they were to my liking. When I received them, I was blown away by the quality of them! The cardstock (115b) are incredibly sturdy. Everything is so clean and precise. The pattern is beautiful and vibrant, the text is sharp and crystal clear. The envelopes are excellent quality. Not to mention the price was AMAZING!! I can't brag on them enough honestly. I will certainly be purchasing all invitations from them from here on out. put your trust in Dawn! Excellent job! The invitations came out absolutely beautiful. We decided to upgrade the paper to the shimmer paper which gave it that extra punch that we wanted. It can be a little confusing to customize yourself, but it just takes a little patience and some playing around with the options. The only con I have about this set is that there aren't a lot of options for the envelopes in terms of matching. However, that being said, for the price and the quality of the invitations, the lack of envelope options did not affect the full rating I'm giving these invitations. I would definitely recommend to friends and order from the site again. Invitations by Dawn is the Absolute BEST! Inviations by Dawn not only provided me with beautiful invitations, but before shipping them, I had chosen a color that did not print well (it was too light). The day after the submission of my order, they called me and gave me suggestions as well as emailed me an example print of my newly changed invitations. I received the finished invitations exactly as they looked in the print, 2 days later! I am very happy with my experience and will use them again in the future. My fiancé and I were trying to find an "affordable" option for invitations, which is nearly impossible. Though this invite is listed as "all-in-one," there's nothing cheap looking about it. All the pieces come separate and the paper is great quality cardstock. The online creation cool is a bit cumbersome, though once you get the hang of it, it moves quickly. We had a slight issue that the final invitations had a color error (they sent black print, we ordered gold) though it looked fine and they were quick to help fix the situation. Invitations were beautiful and shipped quickly! Exactly what we wanted. Disappointed with the envelopes. We upgraded to gold metallic envelopes which were beautiful, however despite getting black ink for the addressing service, it was difficult to read as it appeared really light. Also, of you are planning to use a stamp for your return address, dDO NOT get the metallic envelopes. I tried 3 different ink pads that state they are for mixed media and coated paper and it still would not dry. Just a consideration! Overall, great product. Probably would've paid for shimmer on invitation itself (even though it's beautiful without it) instead of envelope upgrade. Would recommend to others. Great for the price!!! Simple to dress up! I did a country rustic wedding. With brown and black. I dressed it up by folding a doily around it then wrapping it in twine! It came out beautifully for such a low budget!!! I do recommend printing out your "proof" before you order the colors. It doesnt quite match the internet. The invitations were beautiful! We got so many compliments on them and the price was excellent for the quality they have. Definitely recommended! Beautiful invitations for our upcoming wedding! We can't wait to mail them out to our guests. Not only do they look wonderful, but the cost was very reasonable compared to all the other invitations I searched through. We couldn't be happier with our selection and we would highly recommend this company to anyone in the market for stationary products. We were also pleased to find an invitation that printed on both sides of the paper. This will make our postage less expensive and we won't have to worry about our guests keeping track of multiple cards with different information for the invitation; it's all on one piece of stationary, front and back! Love it! Loved how everything turned out! I was surprised what all was included with the sample. It came with everything I wanted, plus all I the different paper options they offer as well as a card with all of their ink options. It made picking what I wanted extremely easy and everything turned out great! I got my order in 2-3 days. I've gotten a lot of complements already! I would recommend this site to anyone! I spent months trying to find an invitation that I liked. I loved the look of this one. It was easy to personalized, play around with to get it exactly the way I wanted to look and change the colors to match mine. The paper is good quality. It prints on both the front and back making it an excellent value to convey information without an added expense. The reply cards are beautiful, same easy process. Everyone I have shown them to loves them. I do not like the fact that there are no other matching coordinates. If there was a matching save the date I would have bought it. No complaints. Everything turned out perfect. Loved the customization, loved the designs, colors match perfectly with wedding colors. Worth every penny! highly recommend. Liked the option to receive a proof and make changes before order was processed. The invitations came out beautiful, even without any upgrades! The color was a tad lighter than expected, but an otherwise perfect outcome for a very reasonable price. Very happy with our decision to go with Invitations by Dawn! Wedding Invitations with coloured envelopes. Beautiful! The purple inside the envelopes compliments perfectly, the design and print on the invitations and RSVP cards. I like that they are all in one invitations. Saves postage with the lesser weight. Great service and delivery. I was excited to see our invitations, and was thrilled that the parcel arrived one day earlier than predicted. They made a huge amount of errors on my invitations. When I asked them to fix it they said it would cost me extra on top of what they had already charged me. I would tell my friends to avoid this site, and I will NOT be ordering the rest of my stationary through them. The invitations were exactly as created online, we loved everything about them. Received invitations very quickly - completely satisfied with service and communication. Color was just a little off from what I thought it was going to be. Overall I love the detail in the lace on the top and bottom of the invites. Also wish I would have put something on the bottom to indicate that there is stuff printed on back. People aren't flipping the invite over and calling about the reception info. Thats what I love about them though, saved money not buying seperate cards for reception etc. Loved that!! But overall very happy with them! Invitations by Dawn came highly recommended by a friend. I went on the website, with so many beautiful invitations to choose from it was hard to decide. We are working with a small budget for a casual wedding. The invites we picked were perfect for our occasion and the endless options made them unique to us. Will definitely recommend Invitations by Dawn to all brides I know. They came so quickly and were perfect in every way. LOVE LOVE LOVE. Absolutely beautiful and exceeded expectations! I am getting married in less than a year and ordered these invitations for my wedding. I am having a formal wedding and the main themes are glitter (or bling, if you want to call it that) and lace. Needless to say, these invitations were perfect and I thought they were very reasonably priced. Since the budget for invitations was a little small, my fianc�e and I just ordered the standard paper and when I received my invitations I was extremely impressed! They were very elegant, exactly what I had ordered and expected and the paper they were printed on was of very good quality. I am very impressed with these invitations, they definitely met and exceeded my expectations; I would recommend them to anyone. I ordered 120 of these invitations and they were sitting on my doorstep just three days after placing my order. I was very impressed! All of my items were well packed and very organized in their boxes. The shipping service was absolutely flawless and super speedy. I loves my invites they were perfect. There beautiful I did not expect them to be so pretty. I'm so glad I choose Dawn for my wedding invites. You guys truly do beautiful work. Your website was super easy to use & the turn around time was super fast. Thanks!!! I will definitely recommend your services. I had an amazing experience and will be coming back to have thank you letters printed!!! I bought these for my May wedding, printed in pink and black on shimmer paper. I couldn't get over how pretty they looked when they arrived. I almost didn't get the shimmer paper, but then I got a coupon when I ordered samples and was able to not go over budget and still get what I wanted. They look just as nice if not nicer than boutique invite places. I ended up buying envelopes from another website because my in-laws culture does not allow for white envelopes. It would've been nice if I could've ordered all from the same place, but I would still recommend these wholeheartedly. I had previously purchased save the dates from this website so I knew I would not be disappointed. The color looks pretty much the same as viewing online. It was easy to customize the invitation and response cards the way I wanted to. They came out fantastic and I can't wait to get send them out! Everything was shipped on time and safely. There were multiple boxes that were put it one big box so everything came together. sad about how the color turned out. It looked darker online. I liked the product except for the color. Good quality, beautiful fonts and quick and easy. I loved choosing the all in one. It was so hassle free. I just wish the color was the same as it appeared on the Internet. Fast, hassle free shipping! You would never know the excellent price we paid for our invitations by looking at them. They are beautiful and high quality, and I am beyond pleased! Ordering with Invitations by Dawn was simple and the invites came in almost a week after I purchased them. I wish there was an automatic spell check when ordering instead of having to pay extra for the service, but I only say that because I made a flub! Even so, a customer service rep made the ordering process quick and painless. I would definitely order from them or recommend them to future brides! Exceeded my expectations! I assumed the response card would be tear off because of the low price but it is a separate card. I am thrilled with these invites, thank you! In the end, these invites turned out beautifully. Very high quality for the price. I had a small problem with one of the colors being much darker than expected. Customer service was so helpful and I was quickly sent new invites with the color problem corrected, no hassle! Overall, highly recommended! Great product and customer service. Would buy again! I LOVE, LOVE, LOVE my invites!!! It took a while to get the right color combo(red/silver text and white card) but am very pleased with it. I would recommend ordering lining on the outer envelopes though if you are using calligraphy markers. Great quality and value. The free samples were very helpful. Ground shipping was fast and very well packed!! Customer service is great and answers all questions right away. Emailed them about error and they sent me corrected envelopes right away! EXCEPTIONAL customer service!!! Website allows for lots of customizing options and I felt confident about what I was getting. It was perfect on arrival. Shipping was amazingly fast. Good packaging. I have already recommended this site to all my friends. Very very happy bride! I purchased the 3 in 1. Such a great deal! The invitations turned out much better than I expected. Because I was ordering them online, I had figured there would be something that didn't go as planned, and that the paper would not be as thick as it is. However, I was pleasantly surprised and my expectations were exceeded! I was very pleased with the product. The quality and value were outstanding. I just wish the purple color I chose was a little deeper than it was. The online color was true to the paper design.I've received good feedback from friends and family that I've shown the invitation to so far. These invitations are inexpensive, yet high quality. They arrived quickly and were exactly as I had ordered. My friends and relatives have been impressed. I bought these invites for my upcoming wedding in brown. They are beautiful and the shipment came in within a week! Only drawback, as I have read on some of the other reviews, the printing was off center on about half of the RSVP cards. I called customer service Monday, the reprints were on my door step by noon the following day...no extra charge and super customer service when reporting the problem. I love these invitations! They took right at 5 days to come in the mail and are so beautiful. I love the lace look and the detail. My colors I chose for my invitations are raisin and pewter and they turned out very vintage looking and better than I expected. Not to mention the price was very reasonable, especially with the promo code that I used. I am very pleased and would definitely recommend! I utilized the live chat for a few questions while designing my invitations. Very helpful service. I love the quality of the paper. And especially like that the reception info and directions are on the back of the invitation so I didn't have to spend more on separate cards! The one problem I had was the digital proof did not allow you to proof the envelopes and my outer envelopes had a different font than I thought I had chosen. I sent an email to the company ( on a sat evening around 6pm) and received a prompt reply Sunday around 1pm! I was impressed to get a reply over the weekend. And the representative apologized and said they would change the font on my envelopes at no charge to me and I would have the new envelopes by Thursday! Great customer service. I loved the design on these invitations! However I was not thrilled with how the colors turned out. I chose the pewter and tango as my wedding colors are gray and coral. When they came, they looked red and black. I ended up addind a coral fabric flower to the invitations to help make the writing look coral instead of red. For this reason I'd reccommend paying for the actual sample. The paper quality was great and even though they're called an all in one, the response card came separate from the actual invitation which was awesome. There was also plenty of room to put directions on the back. We really love these invitations. They are classy, elegant, and no too flashy. Just what we were looking for. I ordered my wedding invitations on Monday and they were at my doorstep by Thursday and that was regular shipping! I absolutely love the quality of the cards and they look exactly how they did on the site! I got the 'All-in-one' invitations and they were super affordable. I also like how this website lets's you customize everything so you truly feel like it's yours! I would highly recommend this site to everyone! Product met or exceeded expectations except:I inquired, was informed that my all in one invitations would require standard $.46 stamp. However, when I took them to local post office, they exceeded 1 ounce and consequently required $.66 postage. Not huge, but added an additional $30 to my postage projection. Having taking the time to inquire about this and being informed via live chat that they would qualify for $.46 postage, I was disappointed. Other than that, we are pleased with. The quality, service, price and delivery time was just a few days. Looked great and people who got them also loved them! Very pretty, well made....wrong color! I love my invitations, but I was very disappointed that I specifically put in the directions that I wanted the colors to match the sample. Something was wrong with the website and it would not let you personalize the colors. I spoke with a representative that told me that if I specified that I wanted the colors to match the sample that it would be printed that way. My colors are light purple and grey..instead I have a plum purple and grey. I did not have enough time to send all of them back due to time constraints. I think the quality of the invitation is very nice and they are very pretty. I have had lots of compliments on them. These invitations are great for the price, especially considering that you get both invitations and response cards. However, I think there is glitch in the ordering system that needs to be resolved. As you can see in the example, there are two types of 'flourishes' that can be different colors. I wanted a particular combination and finally managed to get the preview to show what I wanted. However, when I received them they were the exact opposite of what I wanted. It must be a computer issue because when I called (while I first received nothing but resistance from the customer service tech) their manager said that they have had this issue frequently. Replacement ones came quickly, for which I was grateful. In the end, I am very pleased with my invitations. The only thing I was nervous about was not being able to see an actual printed sample. Some of the spacing looked odd on the online preview, but everything turned out great! I loved my invitations! The colors on the back of the invitation were wrong (all light grey instead of accented with raisen), which could have been a mistake on my part or theirs, but I have no proof of either. If it was a mistake on my part, it speaks somewhat towards the process of customizing the invitations, which I considered not the most user-friendly. If it was a mistake on their part, it's too bad I didn't purchase a digital proof that was an option when I placed the order. This would be more upsetting to me had the accent color been wrong on the front of the invitation, however I am still disappointed because the design is really beautiful with an accent color. The invitations were delivered within a week and in good condition. Before I ordered, I spent a considerable amount of time customizing the invitations in multiple sittings, but only because of the website. The site has a feature that allows you to save your progress and return at a later time to continue customizing or review again later before placing an order. Twice I had to start from scratch because my edits were not saved. There is a warning that your saved items will be removed after a certain period of time (I think 90 days), but mine disappeared within two weeks each time. I emailed customer service about this and received no response. This invitation looks so elegant yet its so simple! There aren't any fancy bows or folds to worry about, so it made stuffing the envelopes so easy. I couldn't be more happy with them. I liked this invite. it gave me enough space for everything. I loved that it was front and back so i didnt have to put alot of cards in the invite it was all on one sheet. We did not use the response cards and needed them blank. But the website forced me to enter an address. Great quality & quick service. Great people to work with and a great product for the cost. I ordered my wedding invites. I got a really great deal for the envelopes, invites, response cards, etc. I found that I struggled to fit all my wording on the invite and did not have many options to make the font much smaller or add lines. Very timely! I was thrilled with these invitations! When I got them I was amazed by how beautiful they were and how they were exactly what we ordered! Sending out these invitations will be a breeze! These invitations are just beautiful! We also has GREAT customer service when we were ordering a big order of 750. They were printed and shipped to us the next day. We are very happy however the back also has a beautiful design and make sure this is addressed and pick the color you want cause if not it defaults to black. I have been looking for the right invitations for about three months now and I am happy to say I finally found them. I am using these invitations/rsvp cards for my wedding. It is a pretty formal event and I am very pleased with the outcome. Although there are few color options, the dark blue option was the exact color I was looking for. The invitations shipped the day after I ordered them and made it to my doorstep in four days. Everything was spelled correctly and the invitations very closely mirrored the preview. Also, the online customer assistance was quick and answered all my questions about the invitations. I had two problems. The first was that the website deleted my saved customized version of the invitations that I had originally finished when I moved it from my cart to saved items. It saved when I finished them the second time, though. I'm not sure whether it was a fluke. Also, I added spaces in the formatting of the text to align some of the wording differently. While it showed the alignment I wanted on the preview, the finished product did not reflect the extra spaces I added. But it really isn't a huge deal because they look great regardless. Overall, beautiful invitations/rsvp cards, the envelopes (which I got lined) are gorgeous, and a great price. My daughter loves the invitations!! Thats ALL that matters!!! Matched our color requests perfectly and the design was so beautiful. So easy to make and send out. I used the site and products to create my wedding invitations. The invitations were done beautifully, and I was satisfied with the end product and for that reason I would recommend the site to a friend, but with some caveats. I would have liked more ink choices and I was very worried about the inks I chose because I couldn't see what my color choices would look like in a sample. I could only get a sample of the provided design displayed on the site. For that reason, I wouldn't recommend this site for high profile, very formal events. It's too dicey not knowing exactly what you are getting before you get it. Finally, I am very computer savvy. I am a Project Manager for a software application company and I found the personalization site a bit tricky. For those not so well versed, it might be down right confusing.